Chhattisgarh announced a proposed investment of more than Rs 1,77,000 crore in the state. 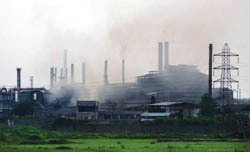 Until October 2008, it had signed over a hundred MoUs with companies like Jindals, Tata Steel and Essar. After a couple of months of this announcement, a bureaucrat heading the state environment regulatory body resigned. “Development is the preferred option, provided the carrying capacity is available. There cannot be a trade-off at the cost of the health and livelihoods of the silent majority,” wrote Sardar Amrieet Prakash Singh, former chairperson of the State Environment Impact Assessment Authority (state EIA authority).